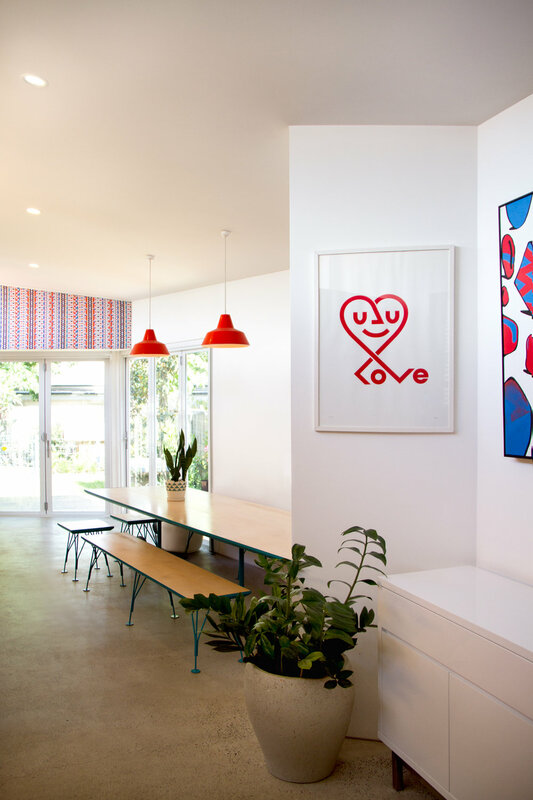 This inner west terrace has been transformed into a modern, art lover's haven. Architecturally designed to suit the owner's love for art, the extension consists of bright colour accents, clean lines and angled walls allowing for lots of hanging space. Originally an old styled terrace, an extension to the rear now opens it up into a free-flowing, open plan home consisting of a new bathroom, kitchen, dining and entertaining area which flows outside onto a deck and quaint, luscious garden. The kitchen is pieced together with plywood cabinetry, stainless steel bench tops and a vibrant red splash back. An illuminated fabric artwork hangs proud over the back bi-folding doors bringing a whole new dimension to the room. The unique shaped bathroom features a glass brick window, a free standing tub and waterfall shower, a ply-wood vanity and bright white subway tiles cascading flush down the wall onto the sandblasted Basalt floor tiles. Deep, metal-clad fascia with disappearing eaves catch the eye outside, while clerestory, highlight windows frame the sky and permit generous light inside. Polished concrete floors, custom bespoke furniture, and the ample use of angles truly tops off this art inspired city terrace. Here is some description text. Dico postea vim in, ad primis No harum interesset quaerendum ius. Vim id mollis tibique gubergren, mei melius splendide consequuntur ut.